Mod The Sims - CEP Extra -- "Dahlen Library Bookcases"
This CEP-Extra modifies the "Dahlen Library Bookcases" from University so that it will use book recolors for the base game's Craftmeister Booknook. Maxis slaved the Dahlen's frame to the Craftmeister's, and the CEP made the Craftmeister's books recolorable, but the Dahlen's books were left unrecolorable, so this CEP-Extra completes that cycle. 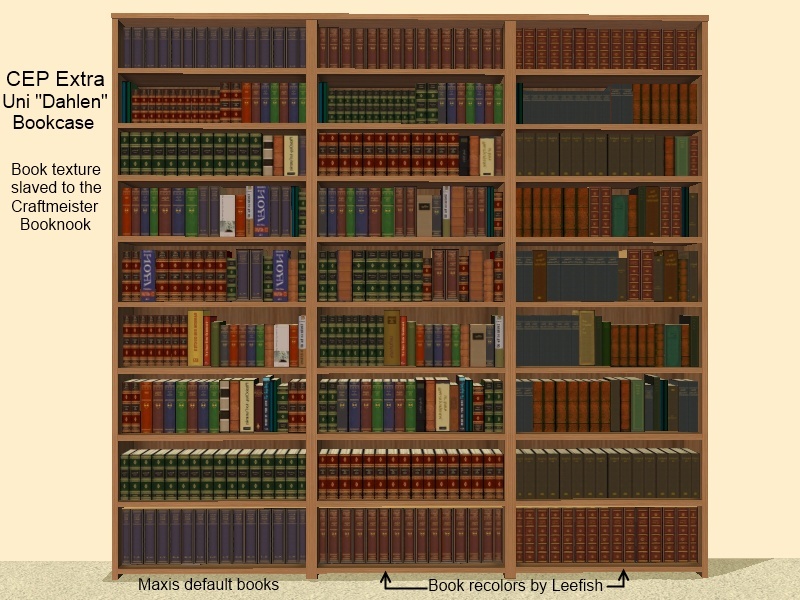 If you have Michelle's Buyable Bookshelf of Education, and would prefer to use her book recolors, I've included CEP-Extra files for both the base game and FreeTime versions of it. If you choose to use this option, make sure to download the correct file for the version of the Buyable Bookshelf of Education that you have. Each version of the CEP-Extra is in its own rar file, so you only need to download the one you want. You can only use one of these files. Whichever file you choose must be placed in \Documents\EA Games\The Sims 2\zCEP-EXTRA . If you used a compilation to install The Sims 2, the compilation's full name (e.g., "The Sims 2 Double Deluxe") will probably be used in Documents. Maxis, for the original object. 43 people have said thanks to dharden for this download.